Major Mark Norris, JRCC (Joint Rescue Coordination Centre) Halifax commanding officer, with Sgt. Rob Hardie, JRCC assistant air coordinator and advisor for SarTech operations, and Marc Ouellette, Canadian Coast Guard regional supervisor for Maritime Search and Rescue at JRCC. 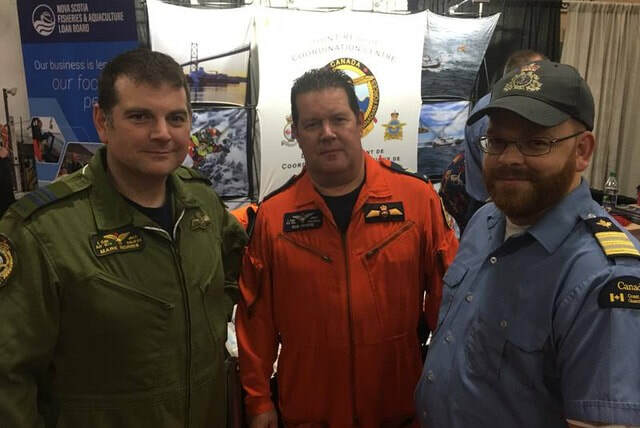 The officers were on hand to meet the public during the Eastern Canadian Fisheries Expo at the Mariners Centre in Yarmouth Jan. 25 and 26. Click on picture above to view complete newspaper article.